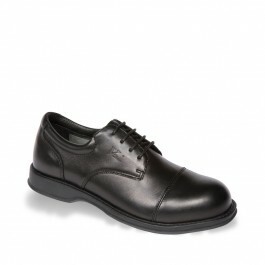 V12 Envoy Shoe - Black Oxford Safety Footwear. V-Class - Quite simply the most comfortable, and highest quality executive safety shoes available. The upper is crafted from soft calf leather and the leather lining and leather shock abosorbing footbed make this shoe not only sleek but seriously comfortable. Soft full grain calf leather upper. Soft yet abrasion resistant leather lining. Cool in the summer - warm in the winter. Full length shock absorbing leather footbed. Absorbs sweat and shocks. Extremely flexible rubber sole providing excellent slip resistance. Conforms to EN ISO 20345:2004 S1 SRA HRO.